And then there were four. With only four teams left with games on their schedule, the vast majority of fans are already looking into how to get better. With that in mind, let’s look at the immediate, most pressing need for each team for the 2019 season. A couple of years ago the Pats arguably had the strongest set of offensive weapons in the league. Now, with Rob Gronkowski a shell of his former self, Josh Gordon’s future uncertain, Chris Hogan hitting free agency, and Julian Edelman about to turn 33, the cupboard looks depleted. 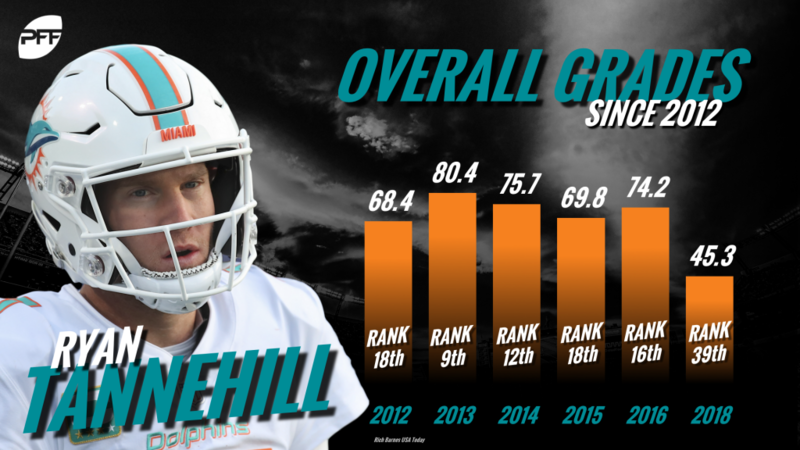 After seven seasons, the Ryan Tannehill era in Miami looks to be coming to a close. Even if he does return, it’s still their biggest need. The former first-round pick earned a 45.3 overall grade this past season. This was a glaring need heading into 2018, and the decline/departure of Kelvin Benjamin didn’t do them any favors. Zay Jones has flashed at times in year two, but he still had the worst yards per route of any full-time starter last year. It seems like the Jets have been in need of a true edge-rushing threat ever since they swung and missed on Vernon Gholston over a decade ago. 2019 is no different. Jordan Jenkins had the team’s best pass-rushing productivity and he still only ranked 27th in the NFL. Unfortunately, the Chiefs are stuck with Anthony Hitchens in 2019 as his cap hit would almost double if he were cut. However, that doesn’t mean they should ignore linebacker this offseason in the hope that he turns it around. Hitchens was the lowest-graded linebacker in the league this year at 40.6. It’s a toss-up between left guard and right tackle here for the Chargers. In an ideal world, they address both. Dan Feeney gave up the most pressures of any guard this season, while Sam Tevi allowed the third-most of any tackle. The Broncos are at risk of losing Aqib Talib and Bradley Roby in back-to-back offseasons without adequate replacements. Even Roby himself may not be the answer, as he allowed 807 yards and a 117.3 passer rating in his first season as a full-time starter. This could just as easily read ‘Defense’ instead of ‘Edge defender,’ but I thought I’d be kind. They had only 13 sacks in 2018. Thirteen!!! That was less than half of any other team in the NFL. The good news is they have more than enough picks to address the need. 1,433 snaps from the Ravens edge group are set to hit free agency this offseason. Za’Darius Smith and Terrell Suggs combined for 116 pressures this season, and neither are assured to be back in 2019. It’s no secret that the Steelers defense looked completely different before and after Ryan Shazier’s horrific injury in 2017. His playmaking ability was never replicated by Vince Williams and Jon Bostic. Those two combined for three pass breakups and interceptions in all of 2018. Gregg Williams almost ran Myles Garrett and Larry Ogunjobi into the ground this past year because of how little depth they had up front. 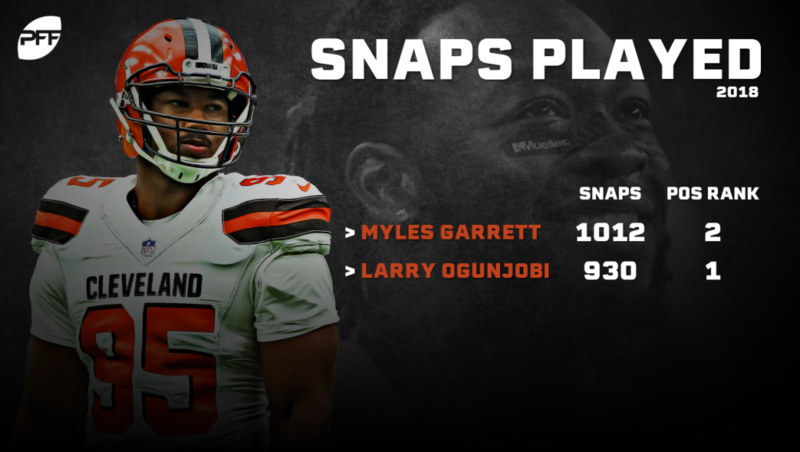 Ogunjobi led his position with 930 snaps while Garrett was second among edge defenders at 1,012. The 2015 draft class continues to haunt the Bengals, but 2019 represents an opportunity to move on. Cedric Ogbuehi and Jake Fisher never came close to justifying their draft status, and now both will be free agents. They have young players at the position, but not good ones. 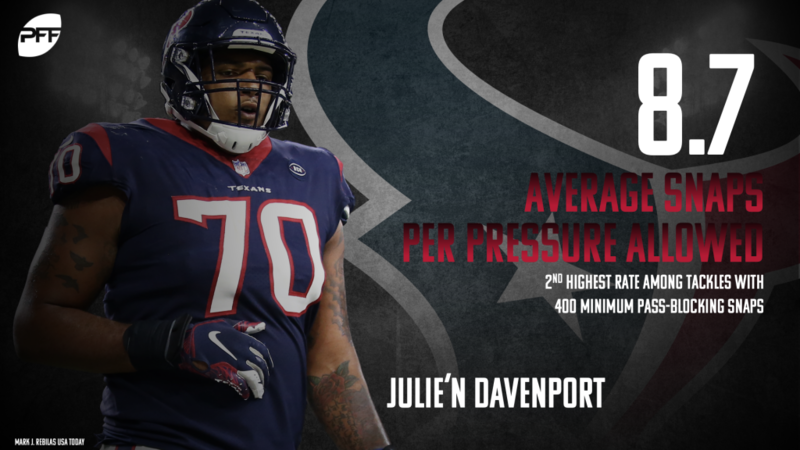 Julie’n Davenport led all offensive tackles with 66 pressures allowed. The Colts’ cornerbacks weren’t nearly as much of a liability as it looked like heading into the 2018 season, but there is still a reason they played the second-fewest amount of snaps in man coverage of any team in the NFL. Their highest-graded cornerback, Pierre Desir (77.7 overall), is also a free agent. With Brian Orakpo retired and 33-year-old Derrick Morgan hitting free agency, the Titans lose their edge group from 2018. Second-round pick Harold Landry showed flashes as a rookie, but that still leaves another starting spot unfilled. Blake Bortles earned a 64.1 overall grade last season, and he was benched in favor of Cody Kessler. File this one under ‘No Duh’. For most teams, the lack of a tight end wouldn’t be the biggest deal, but it’s such a crucial position in the Dallas offense that a quality option could add considerable value. Dak Prescott targeted the position 88 times this past season. Cornerback is also circled in red sharpie for Philly, but they at least have some young options there. At 37 years of age, Jason Peters can’t be counted on to start 16 games even if he doesn’t retire. His backup, Halapoulivaati Vaitai, earned a 48.8 overall grade on 334 snaps this past season. The Redskins don’t employ much of a rotation on the edge, as Preston Smith and Ryan Kerrigan each played over 800 snaps last season. Now Smith is an impending free agent while Kerrigan is on the wrong side of 30. Chad Wheeler was the second-lowest-graded starting offensive tackle in the NFL last season. Even with a fairly quick release from Eli Manning, Wheeler still allowed 45 pressures on the season. The Rams’ edge group combined to register 97 total pressures on 966 pass-rushing snaps this season. Aaron Donald alone had 106 pressures on 584. While Donald may not be a fair comparison, that’s still a wholly unproductive edge figure. Frank Clark was the Seattle pass rush this past season. No other edge rusher on Seattle notched more than 20 pressures in 2018, while Clark had 65. He’s an impending free agent and would create a huge hole if he walked. The 49ers had six different players register at least 300 snaps at safety this season, and not a single one earned a coverage grade higher than 64.0. Four of the six allowed a passer rating higher than 125.0 in their coverage. It wasn’t merely injuries that torpedoed the Cardinals offensive line; they were still one of the lowest-graded in the league at full strength. No position up front is off limits. They finished with a 55.8 team pass-blocking grade – 4.5 points below the next worst. The Bears were arguably the most complete team in 2018. There wasn’t a single position on the roster that you’d say needed replacing. However, right tackle Bobby Massie is an impending free agent, leaving that to be addressed. 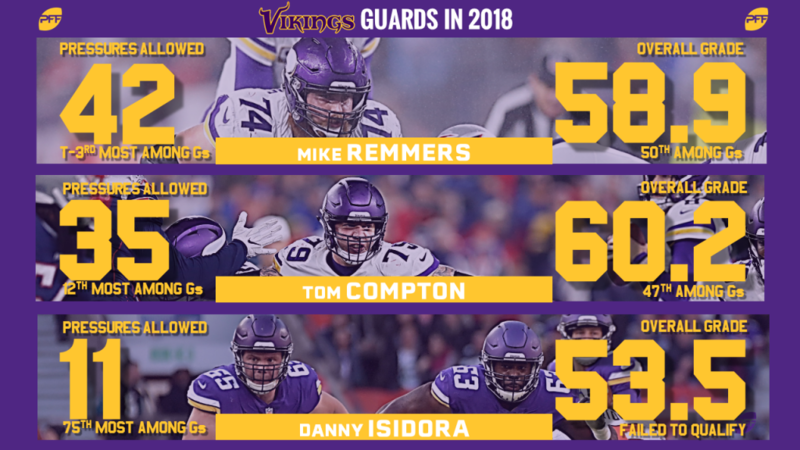 Tom Compton and Mike Remmers earned grades of 60.2 and 58.9, respectively, this past season. It’s a need that’s only exacerbated by all the dominant interior players in the NFC North (Akiem Hicks, Damon Harrison, Kenny Clark, etc.). While Nick Perry’s contract is such that it might not make sense to cut him, he hasn’t come close to justifying his big payday yet. He and Clay Matthews both finished 86th out of 109 qualifying edge defenders in pass-rushing productivity. The Lions threw out a group of castoffs on the edge the majority of the season, and that went about as well as you would think. Devon Kennard and Romeo Okwara had the second and third-worst pass-rushing grades among starting edge players last season. Ziggy Ansah will also be a free agent after his year on the tag. While Drew Brees can make magic with seemingly anyone at tight end, there were still points in the season where the offense went in the tank when opposing defenses took away Michael Thomas. Benjamin Watson will be retiring at the end of the season, but even at 38 years of age, he was still able to rank 12th in yards per route at the position. Grady Jarrett and his 53 pressures are set to become a free agent this offseason. Even if he is tagged or re-signed, there’s still a need. The Falcons ranked 18th in team pass-rushing grade this past season. Matt Kalil’s $55 million deal is shaping up to be an all-time bad signing. He earned a 63.1 overall grade in 2017 before missing all of 2018 with yet another injury. It will cost them more to cut the soon to be 30-year old tackle than to roster him in 2019, but either way, you likely don’t want him starting. The Donovan Smith experiment has run its course with the left tackle set to be a free agent. He allowed over 50 pressures per season in a Bucs uniform including exactly 50 this past year.